Welcome! Come on in and be Our Neighbor! 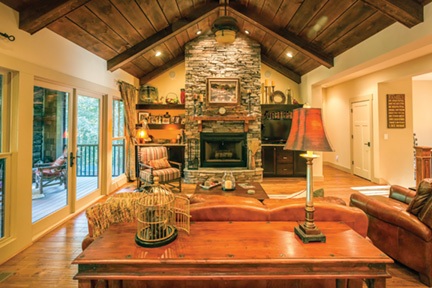 There’s Nothing Quite As Inviting As Craftsman-Style Homes – Especially Those Built On Private 1-3 Acre Lots Amid The Picturesque Rolling Foothills Of Southern Appalachia And The Great Smoky Mountains. Yet The Gated Community Of Covered Bridge Estates Is Filled With These Charmers, Which Are Designed To Be Everything One Might Expect In Modern Mountain Living. Spring dawns and summer’s June firefly spectacle takes flight to a brilliant panoramic explosion of fall colors and the stark silence and grandeur that is winter on the mountainside – residents of covered bridge estates can witness the gamut of the seasons and indulge in July’s abundance of wild blackberries. Sitting on the back porch, gathered in the great room or peeking outside the kitchen window one can’t help but feel a connection with nature – and it feels like home. 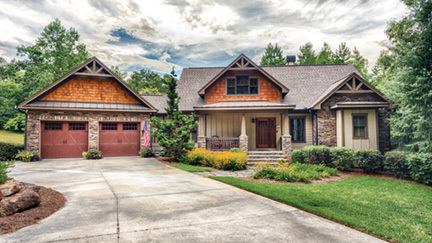 These contemporary craftsman-style homes are built with traditional function and form, taking design cues from a forgone era, while blending a modern, bright open look and feel that’s both alluring and relaxing. 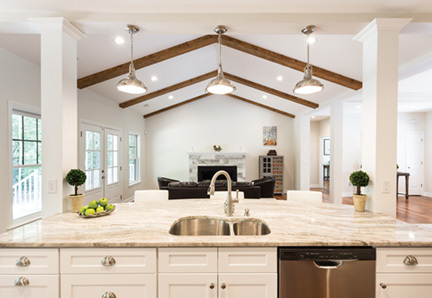 Covered Bridge Estate homes are designed on an intimate scale with stylish wood details, natural materials, simple, straight lines and plenty of charm and sophistication, which are the hallmarks of age-old craftsman architecture. Adding a contemporary twist with open, flowing spaces, an abundance of light and an affection for nature – you’ll discover the heart and soul of Covered Bridge Estates. Imagine a sprawling 200-acre wood that’s a peaceful, private respite, lovingly carved from the breathtaking North Georgia Mountains. 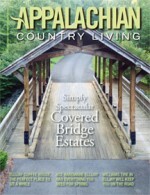 This gated community is located in rural North Georgia and boasts hub-like access to Atlanta, Chattanooga and Knoxville, Tenn., Greenville and Spartanburg, S.C. and Asheville, N.C. Existing home floor plans range from 1,650-3,100 square feet, but custom floor plans are available. The company is currently breaking ground on three new Covered Bridge Estates homes. Additionally, two recently completed homes are available for walk-thru viewing, including one that’s furnished. “It’s all about quality of life,” said Owner’s Representative and General Contractor, Thomas Jackson. Embrace a strong sense of community at Covered Bridge Estates. For outdoor adventurers, wine enthusiasts, foodies and naturalists, there’s an abundance of small-town whimsy. Hiking trails, meandering streams, custom-built homes and a myriad of lifestyle options from wildlife watching to weekend camping, fishing, river rafting, kayaking and, of course afternoon walks, perhaps even across our covered bridge. Plus, there’s Amicalola Falls State Park, Appalachian hiking trails, Blue Ridge ziplining, horseback trail riding, Chattahoochee-Oconee National Forests and Carters Lake to name just a few. North Georgia is the kind of place where people know their neighbors. The Ellijay Farmers Market on Saturdays is a great place to get acquainted with locals. In historic Ellijay, the Cornerstone Café serves up some delectable stuffed pancakes, while Whitepath Golf Club is a great place to hit the links. There’s also Tabor House Civil War Museum, great antiquing, bountiful apple houses and various attractions, eateries and businesses, not to mention the Gilmer County Airport, which provides easy private aircraft access. For a little apple-loving family fun, every October Ellijay hosts the hugely popular Georgia Apple Festival, as well as Georgia’s Apple Blossom Festival in May. When there’s a special day, Gilmer Chamber plans ahead with annual celebrations for St. Patrick’s Day, Gilmer County Fair in August, Halloween, Veterans Day and end-of-year festivities with Light Up Ellijay, among others. Winding down at a local boutique vineyard or winery might be nice. North Georgia is experiencing a robust winery renaissance with more than a dozen producing wineries. Indulge in a tasting or two. At Chateau Meichtry Family Vineyard and Winery one can sample wine in a chocolate glass! There’s also Cartecay or Engelheim vineyards. Most local vineyards host live music and weekly tasting events. For a unique experience, there’s also the family-run Mercier Orchards, where you can take in the sights and smells of an active apple orchard. With all these wonderful attractions, a majestic backdrop and quality craftsman-style homes why would you go home to anything less? Highway 5/515 in Ellijay. From the north turn right, from the south turn left onto Howard Simmons Road. Travel ¼ a mile. Turn left onto Old Hwy 5 and go 1½ miles. Turn right onto 382 West and go 3.7 miles. Welcome to Covered Bridge Estates, on the left!